We couldn't say goodbye to France without a quick visit to the most beautiful city in the world, so we left Annecy a little early and spent the afternoon/evening in Paris. 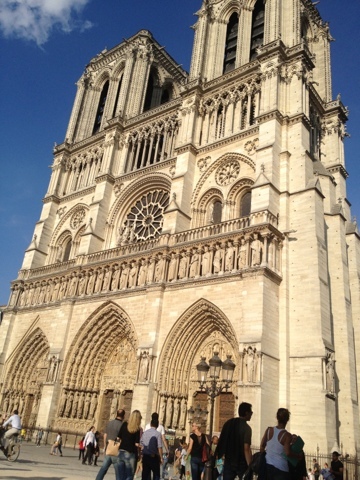 My friend Missy lived with her family in Paris a few years ago, and when I asked her how to spend the afternoon she told me to eat a crepe in front of the Notre Dame. So we did. It was great. 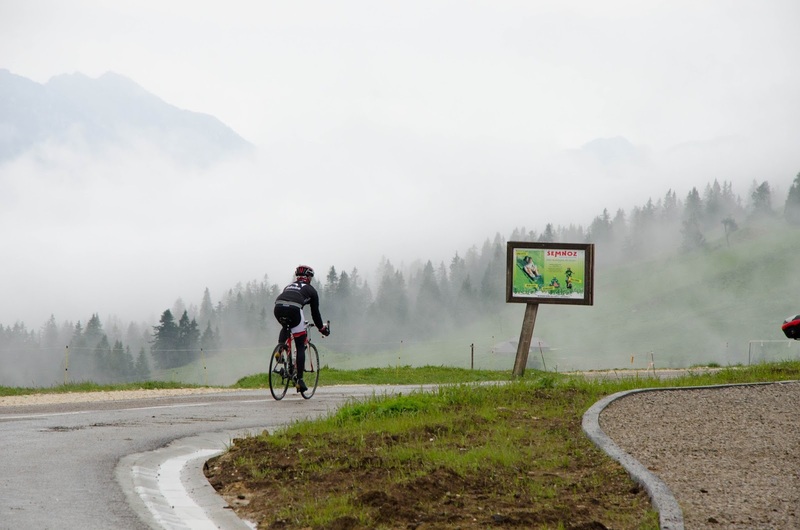 We figured that since this was a cycling trip, we should finish things out on a bike. 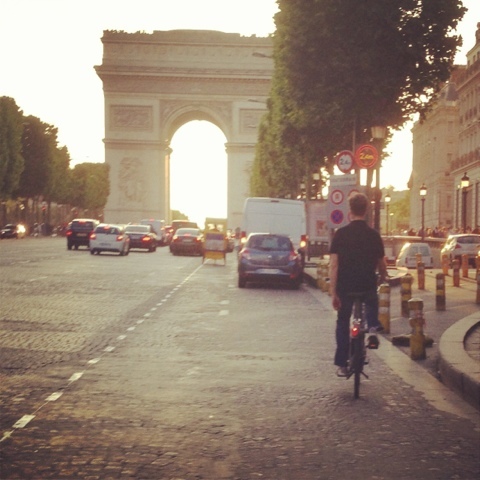 I love Velib bikes. You can rent them all over the city, ride them wherever you want, and then drop them off. Don't worry, Ryan captured it on Strava so I've got all my stats saved. 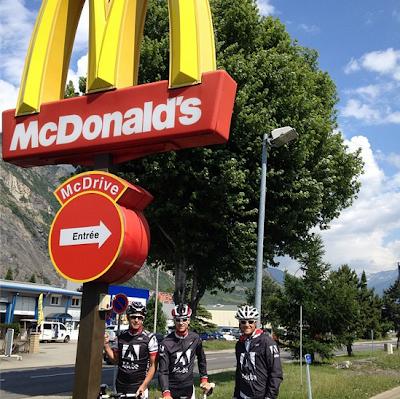 We thought it would be fun to ride a bit of the Tour route. This picture looks calm and idyllic. It lies. The only reason we aren't weaving our way through a parking lot is because Ryan ran the red light (scaring me silly--I am not a pro tour rider!) and we had a few seconds before the cars descended upon us again. 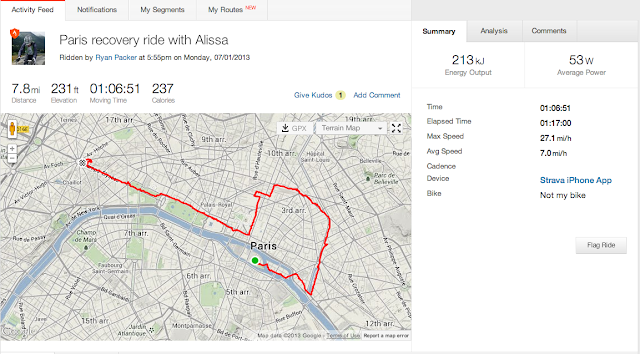 Still, despite being a little freaked out, it was really really cool to ride on the Champs-Élysées. We climbed to the top of the Arc de Triomphe and got a great view of the city at sunset. The iphone panorama almost worked. Then we found a restaurant, ate a very French dinner and walked to the Eiffel Tower. We caught a cab back to our hotel around 1 AM, and called it a successful night on the town. We stayed at the airport Sheraton. It was crazy, because in the atrium there is a glass floor and you can see all the hustle and bustle of Charles de Gaulle, but the hotel is nearly silent. After a good (short) night's sleep we made our way through CDG, only to be thwarted by French military complete with guns ushering all travelers to one end of the airport. You know those PSAs that say, "Please do not leave luggage unattended"? Well, they mean it. The detour cost us some time and I didn't have a chance to get my Laduree macaroon gifts (sorry guys) or breakfast. By the time we got on the flight, I was starting to get my crazy on so I took half of a Xanax my doctor had prescribed as a short acting sleeping pill. Right when the calm was starting to descend upon me the flight attendant came and said, "Mr. Packer, you've been upgraded." Ba. Bam. Best words ever. First class + Xanax = happiest memories of the trip. I enjoyed every minute of that 11 hour flight. I did not want it to end. Luckily, I had a pretty cute welcoming crew to make the transition a little easier. We spent three nights in Annecy, which was heaven after moving EVERY SINGLE NIGHT for the previous 5 nights. 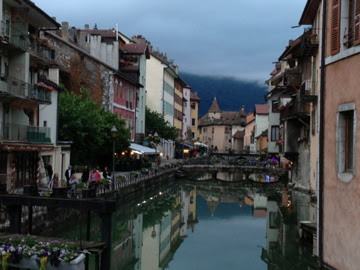 And Annecy was a really cool town. There were canals throughout the city, giving it a Venice-like feel. Some traditional dancers. I love how they are all in their 70s, except the one young couple who looks less than thrilled to be there. The weather was perfect most of the trip--70s--but in Annecy it rained. It didn't seem like a good idea to descend in the rain, so I followed the guys up the climb and we drove down. On Sunday we were lucky enough to find a church right around the corner from our hotel. 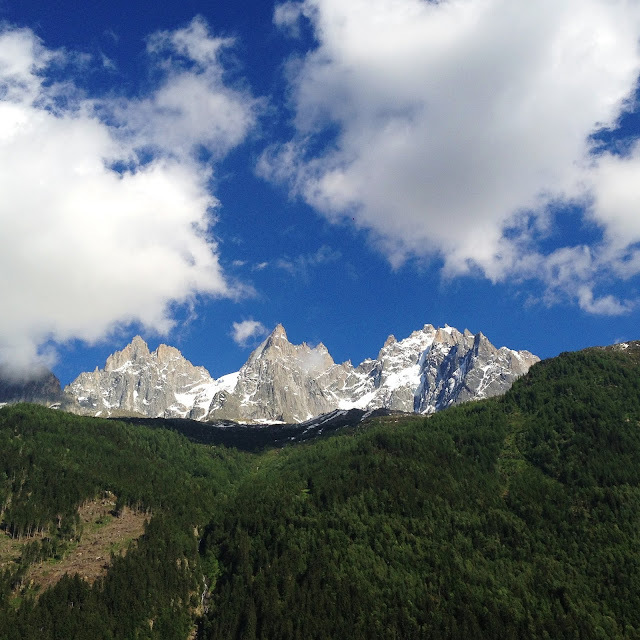 Then we took a quick trip to Chamonix. It was absolutely gorgeous. Some of the most beautiful mountains I have ever seen. We took the tram up to 15,000 feet where you had a great view of all the mountains, including Mont Blanc, the highest peak in Western Europe. 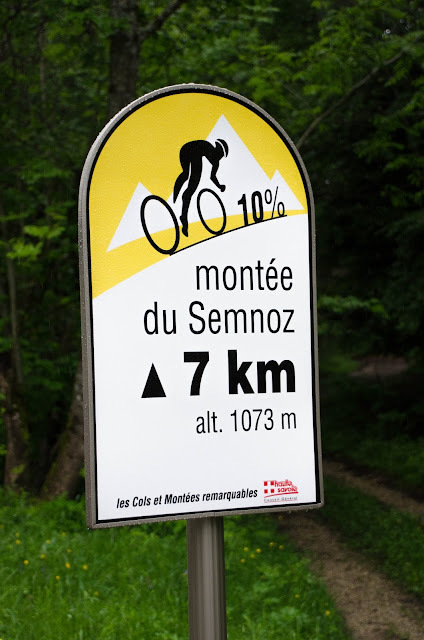 After Ryan's huge climb up Galibier, Telegraphe and Alp d'Huez you'd think he would crash and sleep like a baby. Nope. Up all night. But luckily he was awake enough to drive, because I had no desire to go down Alpe d'Heuz. We drove through the beautiful countryside to St. Jean de Maurienne, which we picked for its location more than anything. Although, like most French towns, it did have a charming old section. And...a McDonald's. I was so excited to indulge in an Apple Pie, because in Europe they still fry them, like they did back in the good old days before we discovered cholesterol. Only to find that the closest thing I could find on the menu turned out to be apples and grapes, not a fried apple pie. Looks like the French discovered that cholesterol thing, too. The guys went on a short ride and I went on a short run (and got lost) and Sandy and Lisa went on a walking tour of the city. We all met up for what was probably our best dinner of the trip. Ryan nearly fell asleep in his food, but the rest of us enjoyed it. The next morning we were off to Annecy. The guys were riding in the morning, so we had plenty of time to mosey on over. 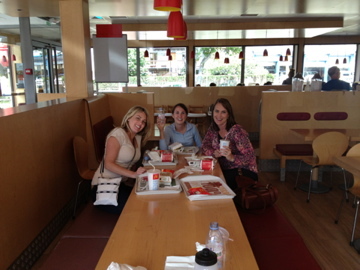 We stopped in Chambery and ate lunch and did a little shopping. 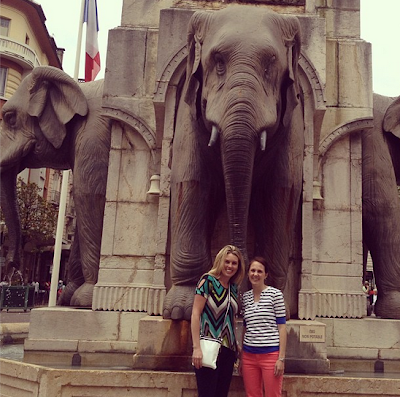 And admired their elephant fountain. Me and Sandy. One quick quip about why I love Sandy Morris. We had decided to meet up in the morning at 10:30. Around 9:45 Lisa and I happened to leave the hotel at the same time. Lisa was heading to the Tourism Office and I was heading to the grocery store. We decided to go together, which was a mistake because each of our things took about 30 minutes. At 10:45 we realized we were totally late and texted Sandy. When we got back to the car Sandy was there with her luggage standing next to the locked car. We said we were so sorry, and she said, "You should be. I'm upset. It would have been nice if you'd texted me before I checked out of my room." We apologized again and she said, "I'm over it. I just had to let you know how I felt so I didn't stew about it all day." And she really was over it. It was a little thing, but could have grown into something bigger if kept inside. I loved that she was so open and straightforward and kept it all in perspective.